Most of us as vets are fond of saying to our clients ‘age is not a disease’. However, we do acknowledge that as our pets age, they are more likely to develop chronic disease in more than one body system and that these diseases may in some cases exacerbate one another. Treatments we give for one illness could potentially worsen a concurrent condition. At the U-Vet Hospital, our Small Animal Medicine referral service offers advanced treatment for specific diseases in your geriatric patients, or assist in the management of those challenging cases where intercurrent diseases require multiple and potentially conflicting treatments. Nutritional advice for older animals with multiple medical problems. Further investigation and management of other endocrine diseases in senior patients such as suspected or diagnosed hyperadrenocorticism. Chronic management of immune-mediated diseases, to minimize side effects of therapy whilst also minimising the chance of relapse. We work in conjunction with other specialty services and can offer an extensive investigation where needed, including specialised diagnostic procedures such as scintigraphy for some hyperthyroid patients or thoracic CT and tracheobronchoscopy for chronic coughing patients. We are also happy to work with you when a diagnosis has been made but assistance with management is required. Many clients are concerned about sedation or anaesthesia in their senior pet. Fortunately, where this is necessary, our specialist anaesthesia service is involved in patient care and where indicated we may perform additional bloodwork, thoracic radiography or echocardiography prior to procedures to assess the risk. As each patient is a much-loved member of a family, our aim is to optimise management of all conditions so that our patients can enjoy a good quality of life for as long as possible. You may consider referring patients for specific treatments or diagnostic investigations that we can offer, or simply for assistance in formulating the best nutritional, therapeutic and monitoring plan for your patients with complex chronic disease processes. The small animal medicine service of U-Vet offers high-level care and investigation for animals with any of the following presentations. Patients with polyuria and polydipsia of unknown cause. Patients with urogenital masses or suspicion of neoplasia. Patients with suspected neurological problems. We may offer the owner additional advice how to manage their pet, for example, an individualised plan for a cat with sterile cystitis may be established. Prognosis and treatment options will be discussed with the client. In order to optimise the treatment, additional advanced diagnostic tests may be suggested. The medical service works in close collaboration with the services of pathology, diagnostic imaging, intensive care, neurology and surgery to offer a range of diagnostic options and the best-possible patient care. Surgical tissue sampling via laparoscopy or during laparotomy. Treatment may vary based on the underlying condition and may include environmental adjustment, nutrition advice, medical treatment, chemotherapy or surgical options. We provide treatment based on the most current knowledge, and aim to offer increasingly minimal invasive treatment options. We are the only medicine service in Australia to offer laser lithotripsy to treat uroliths in dogs. At discharge, the client will receive advice regarding ongoing management. We will provide detailed written information about results of diagnostic procedures and ongoing management plans to the referring veterinarians. Please do not hesitate to contact the medical team if you have further questions regarding this service. Gastroenterology is a rapidly expanding area of knowledge in veterinary medicine, and many believe that many diseases begin in the gut, even if they don’t always show gastrointestinal (GI) signs. There are a number of clinically based research projects within the GI clinical research group (with currently 5 PhD students and 1 Masters student). We are undertaking a number of clinical trials in GI medicine that are able to be viewed on the Hospital web-site. The major difficulty in assessing the GI tract in animals is that it is relatively difficult to determine the cellular processes. The medicine service uses a high definition video endoscope system that provides exquisite detail when imaging the GI tract. We have a range of endoscope sizes which allows us to perform upper and lower GI endoscopy in animals of many sizes. Our endoscopy unit is also equipped with narrow band imaging, which allows us to assess the vasculature of the intestine. 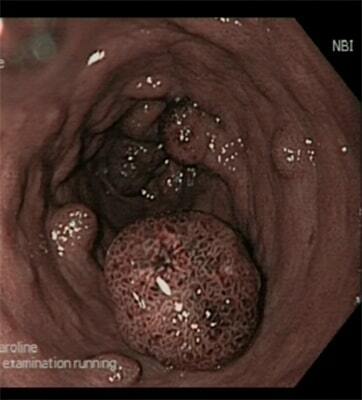 Image 1: Standard white light endoscopy of the stomach of a dog with multiple gastric polyps. Image 2: Narrow band imaging (NBI) from the same dog highlighting the vascular pattern of the polyp seen in the stomach of the dog in Image 1. 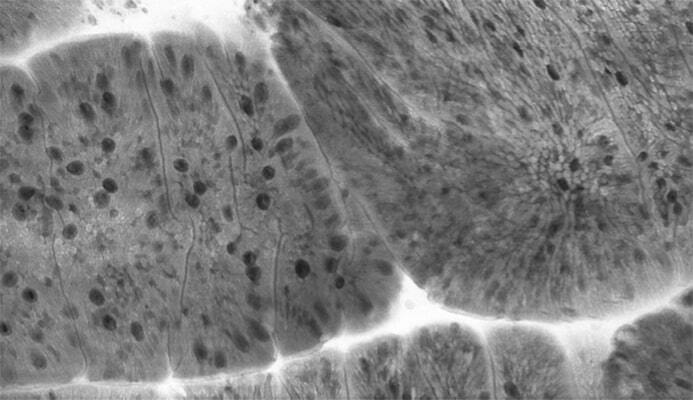 Image 3: Confocal endomicroscopy using intravenous fluorescein highlights the goblet cells and microvascular detail of the small intestinal villi. 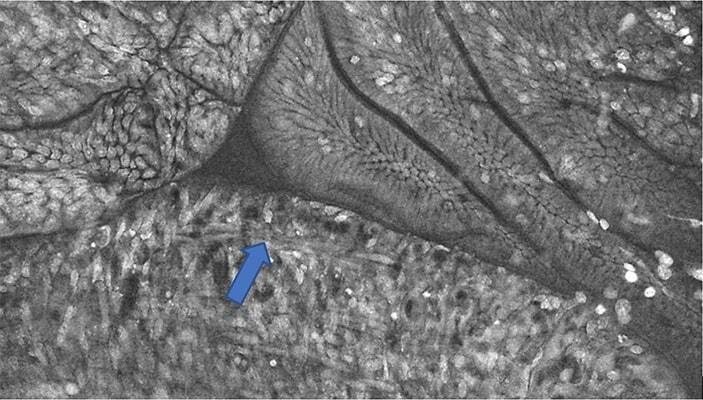 Image 4: confocal endomicroscopy using topical acriflavine showing deeper tissue planes such as the smooth muscle from the muscularis mucosae (arrow). We are also currently heavily involved in assessing novel ways of treating animals with GI disease - including the use of faecal microbial transplantation. Dogs with recurrent bouts of pancreatitis, or persistently high lipid levels. The management of diabetes in people is a very complicated process - with the aim for tight glycaemic regulation. We do not require such tight regulation in our pets as circulatory problems are not as common. However, there is certainly the opportunity to improve glycaemic control by having as much information as possible for an individual pet. The most common causes of poor response to insulin administration in pets are thought to be inadequate duration of insulin, poor absorption of a particular type of insulin or concurrent medical conditions. Additionally, people get a condition called nocturnal hypoglycaemia whereby the blood glucose drops about 2.00-3.00 am. in the morning, rebounding to quite high levels in the morning. We have documented this several times in dogs, and believe this rebound hyperglycaemia can persist for 12-18 hours, leading to poor control of clinical signs. Rather than rely on serum fructosamine or serial blood glucose curves (which are difficult for the animal and often of too short a duration to be helpful), we use a continuous glucose monitoring system. This system allows us to record up to 36 hours of blood glucose, thereby noting the trends, the peaks, and the troughs associated with insulin and food. 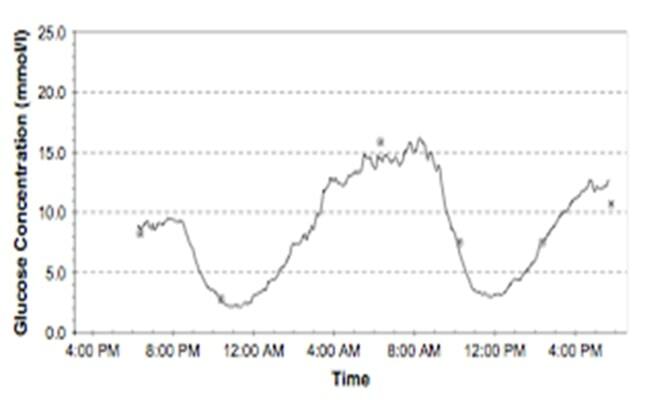 Figure 1: Continuous blood glucose monitoring graph from a dog, starting at 6.00 pm. If the normal blood glucose curve was performed (as indicated with an asterix) with blood glucose obtained every 1-2 hours then the dangerously low nadir would have been missed. We can offer continuous glucose monitoring as a standard referral service, or on an outpatient basis, where communication and recommendations are made directly with the referring vet (with the exception of when a dangerously low blood glucose is noted necessitating an immediate reduction in insulin).